Home Case Studies Maggie D.
Maggie had terrible diarrhea when I got her from the breeder at 4 months old. She had a bout of Coccidia when she was a baby and then tested positive for it again when I got her so she was re-treated with Albon for 10 days. The diarrhea continued and about that same time, her “aunt” tested positive for tritrichomonas foetus. We tested Maggie and sure enough she also had it. She was treated for two weeks with ronidazole and later cleared of it (second PCR test was negative). Even though she was no longer testing positive for parasites at this point, the diarrhea continued. This is when I requested extensive testing and the results came back showing high e.coli in her stool. She was treated with a strong antibiotic (sorry I don’t remember which one now) and the vet told me that if that didn’t resolve it, I needed to move her to a one meat-only diet. The antibiotic didn’t do anything so this is when we essentially diagnosed it as IBD (although I never went back to that vet b/c she got injured there). My new vet is a cat specialist who actually raised Abyssinians and she agreed with this assessment. She told me that because of all of the parasite she had as a baby, her GI system is damaged and likely scarred. She put her on a mix of 50/50 Albon/Amforal to try to help her system heal and get it to slow down. She was also given cyproheptadine as needed for times she refused to eat. Soon after, the new grain-free diet had started helping and she no longer needed any other medications with the exception of Pepcid A/C twice daily. I also continue the B12/B1/Folate as mentioned below, usually every other to every 3 days. Her appetite has been pretty strong lately but I find that when she starts getting overly picky, this B vitamin combo usually takes care of that. Current Supplements/Meds: Dr. Goodpet enzymes with food daily, slippery elm bark as needed for inflammation, 2.5 mg Pepcid AC 2x daily, B vitamins, every other to every third day: B12/5000mg sublingually, B1/50 mg, folic Acid/200 mcg. Also supplementing taurine, calcium, vitamin E and salmon oil depending on how much raw meat she’s eating. Food: Dry out at all times – Merrick’s B.G. (Before Grain) Chicken, usually ¼ cup per day Raw: turkey or duck meat, usually 2-4 ounces per day. Various canned depending on appetite – By Nature chicken and liver pouch, By Nature turkey and liver/chicken and liver cans, Evangers Turkey and Butternut Squash, EVO 95% chicken/turkey, duck and venison, Avoderm chicken chunks (mashed), usually 2-4 ounces per day. The canned and raw are rotated depending on what she’ll eat that day. Total food intake is usually around ¼ cup dry and 4 ounces raw/canned. The only thing that seems to resolve her diarrhea is when she eats raw meat, even if it’s only 30-40% of her daily intake. She also seems to have problems with corn, grains and peas. I’m also starting to think she may have a problem with chicken as well, but until I can convert her to a novel protein elimination diet, I don’t know for sure. I have not figured out what resolves her inflammation in general. Even though she has had normal stools for as long as three weeks, her appetite and pain were still present and increasing over that time. This is why we are working towards an elimination diet. Here is a recipe I learned about from the chronic renal failure Yahoo group for nausea in a kitty and for getting them to eat. I take a tablespoon of hot water and mix it with about 1/2 capsule of Slippery Elm Bark powder. As it starts to cool, it will thicken. Sometimes I have to add more powder and sometimes I have to add more water to get it to a thin enough consistency that I can syringe it up. The syringe I’m using is 3ml I believe so I just completely fill it. Then I just stick it in the back corner of her mouth and she drinks it down without complaint. She doesn’t run from me after which is how I know she doesn’t mind it. Just be sure to make it as thick as possible as it helps coat the lining of the GI tract, similar to Pepto Bismol. They call it a “liquid bandaid” and you’re supposed to give it 30 minutes apart from any food/supplements since it can reduce absorption. However, when Maggie is ready to eat at 10 minutes I don’t worry about the time lapse. I stay pretty strict with the time when I’m giving medications though. There are some instructions I found on the web for using 1/4 cup water and boiling it with the SEB on the stove for a couple of minutes, but I find that this makes way too much and it doesn’t keep at all. This is why I now just use my little water heater (for tea and such) so I make only what I need at the time. It works like a charm. These are treats that Maggie gets after she gets her pills to make sure they go down all the way. She goes absolutely nuts over them! Pogos 100% pure rabbit treats; Bravo Oven Roasted/Dried Chicken Breast treats. I recently started Maggie on L-glutamine, glucosamine Sulfate and MSM for her injured knee. Unfortunately, one of these three caused some major inflammation and she is now taking 5mg of prednisolone daily. We are hoping to work our way off of prednisolone completely once this flare-up settles. – glucosamine sulfate uses potassium chloride as a stabilizer, which can sometimes upset the stomach. – glucosamine HCL uses Hydrochloride Acid as a stabilizer, which contains sulfur. She is getting Adequan shots for her arthritis, most likely due to a vet tech dropping her. Adequan via injections versus a pill bypasses the GI tract and is better absorbed this way causing less to no stomach upset. She also takes Pepcid A/C no sooner than 30 minutes prior to her meals and it seems to be working much better for her in alleviating the nausea and pain. Although she still has a few bobbles now and then, she has improved greatly over the last two weeks that she’s been on these. She is still getting the 5mg prednisolone and two doses of Pepcid daily, but these new additions appear to be helping her even more. She is still getting monthly Adequan shots for her arthritis and I had her on GNC’s Natural Brand Spirulina for a bit. It’s allergy free (no dairy, soy, gluten, etc.) and full of B vitamins. I removed it to start the Chinese herbs as not to overwhelm her system but plan to add it again within the next week as she was doing very well on that also. June 30, 2009: After a few months I have revised and simplified Maggie’s routine even further. I tried the Central Chi for several weeks, but then decided to switch her Chinese herbs to the Four Gentlemen formula based on a friend’s recommendation. She gets one teapill twice daily. I stopped the yucca intensive since it was more of a burden to give than it seemed to be worth for her and I also switched her to a more inclusive digestive enzyme supplement called Total-Zymes. Maggie’s diet has been simplified as well. I noticed that her nausea was happening most often when she hadn’t had food for a long period of time. So, I gave in and decided that she needed to have a very simple dry food out for when I’m not home to give her canned. I decided to go with California Natural Chicken and Rice as it was the most simple formula I could find. Since it contains rice and dry is harder to digest than wet food, I add a scoop of Total-Zymes to each cup of food and keep a bowl filled for her at all times. She is also limited to just a couple of different wet foods which includes Wilderness Turkey and By Nature Chicken Fricassee bowls. The revised supplements and food has been really helpful for her IBD. In fact, two months ago I started reducing her prednisolone and she has continued to do very well. She dropped from 5 mg to 2.5 mg for a month and is now on 2.5 mg every other day. I will try taking her off of the prednisolone completely in another few weeks. She does still get Adequan shots for her knee, but since her prednisolone has been reduced the pain has started to return. She will be re-evaluated by the orthopedic surgeon in the next couple of weeks to determine what the next step is for her knee. October 12, 2009: After our last visit to the orthopedic surgeon, Maggie is no longer on the Adequan shots. She was formally diagnosed with a torn ligament, but since she no longer limps, we decided the shots weren’t worth the trouble. Everything has remained the same for her IBD treatment and although we do still go through a few days of flare-ups, overall she is continuing to do extremely well. February 10, 2010: Maggie has been doing very well lately. She has been off of her prednisolone for months now and only requires the pepcid and Four Gentlemen teapills. She continues to eat both her usual wet foods and the Cal Natural dry, but I’ve since added some Purina “Sensitive Stomach” dry to her routine. She was starting to really get picky with the Cal Natural and since she does better when she can eat small meals often, I wanted to offer another dry out at all times. She has been doing well on this food. Unfortunately, she developed a terrible upper respirator infection in January. For over three days I had to hand feed both her and my other cat. She was on an antibiotic for ten days and has recovered nicely. In fact, I’m actually noticing that she has more energy and a better appetite since her recovery. I’m not sure if this is a result of the antibiotic or the new dry food. Either way I just hope she continues to do as well as she is currently. June 10, 2010: Maggie is continuing to do great! So well in fact, that I’ve discontinued the Four Gentlemen teapills and she’s now just taking the pepcid twice daily. I rotate all of her wet food so that she never starts associating one variety with any nausea she might be having. She’s eating wet food so well, that she really eats very little dry food these days. When she does, it’s primarily the California Natural still. We just had her first check-up at the vet in quite some time and the vet said she looked great. All of her labs were normal and there were no IBD “sounds” coming from her tummy when she listened. Unfortunately, she’s had some problems with allergies this year and as a result, has been losing her voice some. She’s been taking an antihistamine, chlorpheniramine, and doing pretty well on it. Hopefully things will be back to normal there once seasonal allergies die down around here. Here are the foods she currently eats: EVO Duck (this is her primary diet), Soulistic (the two chicken varieties), Blue Wilderness Turkey, Feline Pride Turkey. November 6, 2010: Maggie is still doing really well these days. Although she still has problems off and on with losing her voice, it doesn’t appear to be affecting her health in any way. I believe now that there is some sort of small defect in her epiglottis because she coughs almost every time she gets a drink. From what little I could find in my research, this appears to be an uncommon anomaly in cats, but they all seem to live otherwise normal healthy lives. As far as her IBD goes, she has primarily moved to EVO Duck and Blue Buffalo Turkey. She has her two primary meals of choice, but still gets the Soulistic chicken varieties and By Nature Chicken pouches here and there for variety. The pepcid twice a day and restricted diet seem to have her IBD under control for now (knock on wood!). June 29, 2011: Over the last several months, Maggie’s coughing became worse. She was officially diagnosed with asthma in January and has been on Brethine and prednisolone (2.5 mg) daily since that time. In addition to the coughing, her swallowing function appeared to be inhibited so she had an ultrasound and endoscope done. Fortunately, neither showed anything but they did find a LOT of mucus in her lungs. The vet treated her with antibiotics to cover several types of lung infections, even though culture results didn’t show anything. In addition, I started giving her lysine, 500 mg daily for 3 weeks and now at 500 mg every other day and she is doing much better. We go back to the vet this weekend for another x-ray to see if we can start weaning her off of the prednisolone. I think allergies are playing a big part in all of this so I plan to talk to the vet about that also. The good news is that her IBD is still relatively stable, although I’m sure the prednisolone has helped in that respect as well. September 8, 2011: July 16th – Maggie wasn’t doing well, she had diarrhea all week. I’d thought it might be the metoclopramide so I stopped giving it to her on day 3 because I thought it was making things worse. She had one really good day that week (eating almost everything in sight), but then declined again the last 4 days. She was avoiding me and sleeping all the time and I also thought she could have pancreatitis. That’s what they suspected when she was 8 months old and diagnosed with IBD, but the tests never did prove it. Her asthma was terrible and she was having a lot of trouble breathing. She’d pretty much lived in the front bathroom the last two days. She’d gotten a total of 8 steam treatments and looked better but after a really good breakfast she went back into the crate in the bathroom. She’d stay there all day except she came out twice to use the restroom and get a bite to eat. When she was out and about she looked completely normal. Her eyes were wide and alert and she cried for food while I was fixing it. -Third eyelids showing when I gave her pills and occasionally her eyes looked squinty. -Difficulty breathing (nasal passages sounded congested). -The occasional sneeze (but only about once every other day). -Complete loss of voice and difficulty swallowing – same issues she’s had since January. -Extreme lethargy: She’d only get up to eat, drink and use the litter box. The rest of the time she was either on a towel on the floor in my bedroom or in the carrier I’ve left in that front bathroom. She was never up on my bed or on one of the cat trees. -Hunching immediately after eating or drinking, for about 5 minutes, often with eyes squinted and then laid down in the meatloaf position. She would typically sleep in this same position but stretched her head and neck out in front of her on the floor. -Isolating herself: Most of the time she went in the front bathroom to be alone. Usually when I try to lay down with her, she would let me stroke her back for about 30 seconds and then get up, walk about a foot away from me and lay back down in the loaf position, usually facing away from me. The confusing part is that when she was up and wanting to eat, she seemed pretty normal. She tried to cry for treats, but of course no sound came out. She was eating well and had gained weight when I took her to the vet that Saturday. Her drinking was a bit odd because she’d drink for a few seconds and pause for a while, then drink again and pause and repeat this until she was satisfied. It was almost as if she got winded when she drank or perhaps the water hurt her in some way when she swallowed. Half of the symptoms were UR and the other half were GI. That’s why something like FIP was the only thing I could think of that seemed to fit the bill. There are several forms of it with only one of them being neurological. But the problem is that symptoms vary from cat to cat which is why it’s so hard to diagnose. It can really only be diagnosed via biopsy after death, but a fluid-filled abdomen is a sure sign. Maggie had a high titer of the corona virus when she was little, so the vets had said FIP was always something to keep in mind down the road. At this point, she was acting like a very old, sick cat and she was only 3.5 years old. 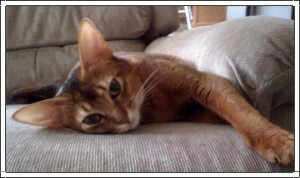 July 29, 2011: Since she still wasn’t getting any better, I took her back to her regular vet for further work-up. She was running a fever and an x-ray showed what appeared to be pneumonia again. Her abdominal x-ray was clear, no signs of FIP fluid building there and her GI tract looked great. They ran a blood panel and that’s where the turn came in; she was very anemic. So the vet sent her blood with slides to the lab to do some more testing. Anemia can be caused by a lot of different things; bad viral infection, leukemia, a type of parasite, etc. They would determine if the anemia was regenerative or non-regenerative. If it was non-regenerative, that meant her bone marrow wasn’t functioning and that’s a serious concern. 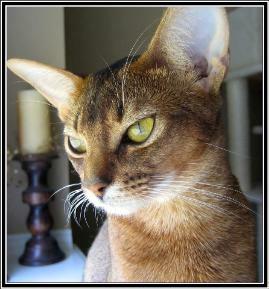 She did say Abyssinians have been known to have an unexpected drop in RBC’s for an unknown reason and that one of hers actually had that happen. In the meantime they gave Maggie fluids and a B12 shot and sent her home with an antibiotic, VAL syrup to support the anemia, and buprenorphine to keep her comfortable. Normally the vet would have kept her in the hospital, but since Maggie stresses out so much while she’s there, she said it would be better for her to be at home. She also knew that I was more than capable to continue to give her sub-q’s, check temp, etc. I was told that if her fever hadn’t broken by Sunday, I needed to bring her back first thing Monday. August 1, 2011: The vet had told me that if she wasn’t showing improvement that I would need to bring her in first thing in the morning, so I dropped her off at 9:00. Her temp was up to 105.2 (from 104 on Friday) so they’d put some ice packs under some of her bedding and were having her lay on it to try to get it down. They also gave her a shot of Baytril to see if that helped since it gets in the system faster than the oral antibiotic. In addition, her x-rays from the chest were about the same, but she had become completely constipated so they gave her an enema. They also put her in the oxygen tunnel to make her more comfortable. Given everything going on, they wanted to keep her in there overnight and then decide what to do the next day. That night her temp dropped to 102.7. August 4, 2011: The clinic called to let me know that Maggie had improved greatly and that they were hoping she’d be able to go home the next day. Sadly, I wasn’t able to visit her today because of a doctor’s appt I had scheduled 3 months prior and would have to wait another 3 months if I rescheduled. Since she was doing so well, I decided I would go ahead and make the doctor’s appt. August 13, 2011: I went to visit Maggie, still in the oxygen tunnel, and she looked so weak and still struggling to breath. They hadn’t been able to run more tests because every time they tried she’d go open-mouth breathing. I knew that a decision needed to be made, but because Maggie continued to sit up and eat so well, my vet didn’t feel it was time yet. Maggie was still fighting with everything she had, so I agreed that I wouldn’t give up on her either. August 14, 2011: I got a call from my vet around 9:15 that morning to let me know that Maggie had just passed away. The nurse and another tech were there. The tech had given her some chicken, just a little and a few minutes later the nurse went to check on her and she was gone. My vet was crying and told me that she truly believed in her heart that this was FIP and so did I. We agreed to do a necropsy to confirm. They let me go up there that morning even though they were closed to tell her goodbye. She looked so peaceful and was still slightly warm. I kissed her little head over and over again and told her how sorry I was that I couldn’t save her or be with her in the end. I can’t believe my baby is gone. August 27, 2011: My Vet called and said that the results of the necropsy showed granulomas in Maggie’s intestines & liver consistent with FIP. She said that she definitely had pneumonia also, but that it was a secondary infection to the FIP.